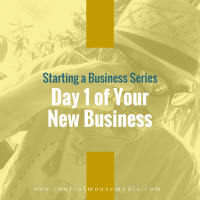 When you’re starting a new business, it’s a mixture of excitement and fear. Excitement is easy. The hard part is overcoming your fear – fear of failure, fear that you are not doing enough, and fear that you are letting down your partners, investors, employees, or customers. Sometimes that fear is so strong that it can be paralyzing. This is where it helps to have a system. I found this out pretty quickly when I first started my business – and discovered that the best thing you can do is to lean into your strengths. This is especially true in the early days, when you feel unmoored. For me, that’s writing. Maybe this would work for you too. Every business owner needs content – at the very least, describing what your business does (or is going to do). So if you’re not sure what to write about, start with the 5-6 most common customer questions – or the things you think you’ll need to answer about your business. The sooner you start interacting with and learning about your audience, the better. You’ll start to see a market need more clearly – not through your eyes, but through their eyes instead. Ultimately, you’ll be in a better position to serve your future customers. In Episode 121, I take you back to Day 1 of my business. Feel the fear – listen to it right here or subscribe in Apple Podcasts. Subscribe here (and select podcast / every new post) if you’d like to be notified as soon as new episodes in this series are available. I publish about every other Monday. 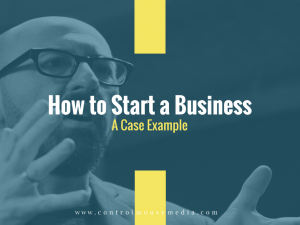 This series is available in video format in the form of a free online course called How to Start a Business: A Case Example. In it, you’ll find worksheets, templates, checklists, and other tools that will help you with your own content strategy. For writers and other artists: I also offer a much more substantial online course to teach you how to build an audience around your creative work – without being pushy and sales-y. It’s modeled after the course that I teach at Emerson College. Listeners of this podcast get a discount by using this link: https://controlmousemedia.com/mwm. Published March 19, 2018 by Michael Boezi.